Just a real quick note with the holiday tomorrow and the long weekend to follow for most of us. I'll be at home with the family doing all kinds of family stuff. I have a couple posts scheduled for the weekend for those who steal a minute here or there to check out the site. If not, no worries, swing by Monday and catch up like normal. I look at the site stats, I know what you all do. I'm still hot on the heels of this whole weathering powder thing and getting them sealed in place once applied. I am truly grateful for all the comments and suggestions everyone has shared in the posts. I worry sometimes I am going over the same thing over and over again, but I think it helps to try and cover all the bases when it comes to these kinds of things. I may have some great info to share in the coming days with a workable solution. No promises though... I haven't put it to the test myself yet. Yep, I have enough scarabs to build another one and make some improvements. All that will be coming in the next few weeks. I'll be covering the casting process as well for those who asked about it. I'll also have a base review to go along with this. So it will be couple different things to come from this project. 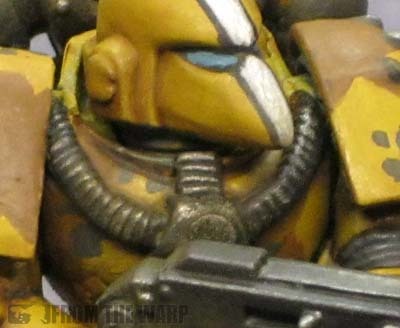 The picture above comes from a model I did for someone as a test for a paint scheme. I'll have the construction and painting aspects of this guy in the coming weeks as well. If you've got any questions about something in this post, shoot me a comment and I'll be glad to answer. Make sure to share your hobby tips and thoughts in the comments below! Happy Thanksgiving everyone! Great! I'm looking forward to more discussion / research on sealing powders to models. You offered quite a tease when you said there was a method out there that the pro's use. I hope you find that out and share it with your loyal followers. Secondly, I would be careful sharing how to cast copyrighted GW material. It is fine to show how to mold and cast your own work, but I'm sure GW would rather have you buy more Necron swarms than have you make your own. Maybe I'm just paranoid, but why take a chance? Looking forward to more info on the weathering powders and sealing them. I've been waiting to weather my marines until I find a good method to keep the powders looking good and not washed out. I built 10 swarm bases based on your tutorial, they look hot. Pics will be up on eyeoferror early next week. I LOVE the looks of that Beaky marine in Camo! Happy Thanksgiving, and thank you for all you have shared with the hobby community. Jason Gross and ephrael: More to come this Monday. LuckyNo.5: We've already talked, they look great! Mr. Esty: He'll be a two post thing in the next month or so. One for the painting and the other for the construction since I had to "build" the MK6 version chest plate he's sporting.